A small town in northern Ukraine that would be totally unremarkable if it wasn't for its association with Chernobyl, or rather the ghost town of Pripyat. 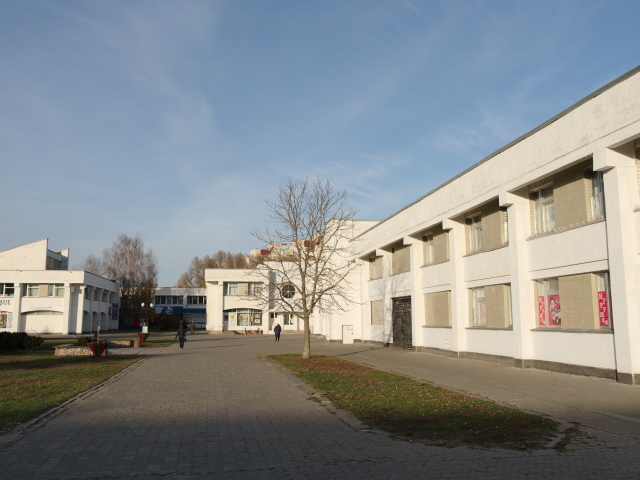 Slavutych is the planned, and quickly constructed new town that after the disaster in 1986 replaced Pripyat, in a location 30 miles (50 km) further east, as the place to house the employees of the Chernobyl NPP. To this day, a couple of thousand workers commute daily to the Zone from Slavutych … and it's a route into the Zone that you can also take as a visitor, as an exotic and exciting alternative to the usual entry via the Dytyatky road checkpoint. 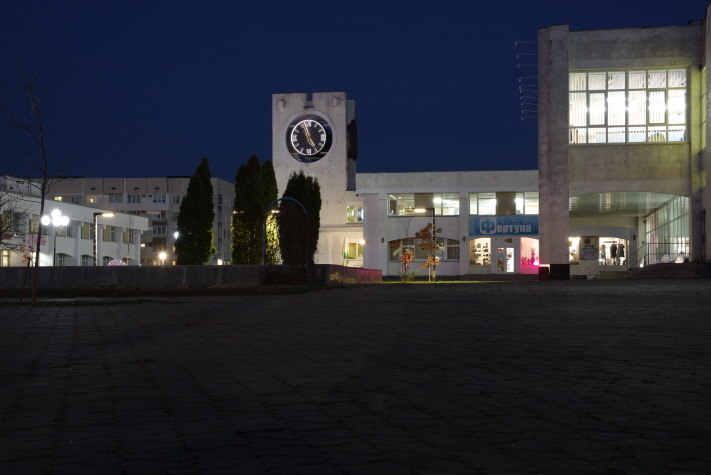 Moreover, Slavutych also has its own museum covering the 1986 Chernobyl disaster, the subsequent clean-up operations and the creation of this replacement residential town. More background info: For the 1986 disaster see especially under Chernobyl NPP. For the Exclusion Zone in general see Chernobyl, and for the town that Slavutych replaced see under Pripyat. 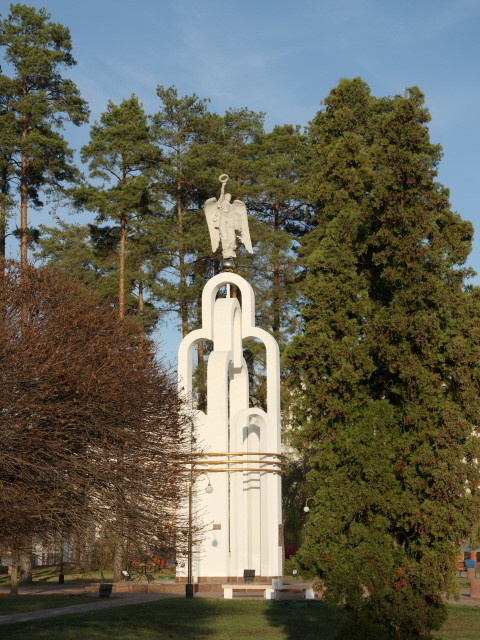 Slavutych was purpose-built shortly after the April 1986 Chernobyl disaster, from ca. October that year onwards. 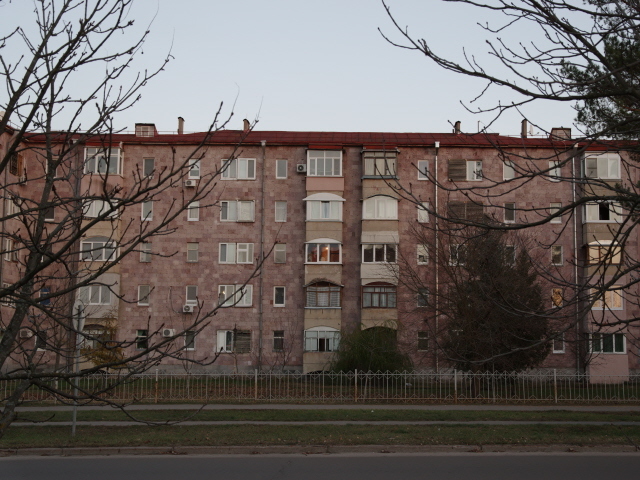 The first residents, who until then had to be relocated to temporary housing, moved into the apartments in Slavutych in 1988. Construction was a typical glorified joint Soviet effort, with eight of the 15 Soviet Socialist Republics participating (all independent states now: apart from Ukraine itself, as well as Russia, these were: Armenia, Azerbaijan, Estonia, Georgia, Latvia and Lithuania. Each “sent” (more likely: were ordered to send) not only workers but also building materials, and each were given their own district to create. Hence you notice e.g. the characteristic red-hue-ed volcanic stone blocks familiar from Yerevan and other Armenian places in the relevant “Armenian” quarter. 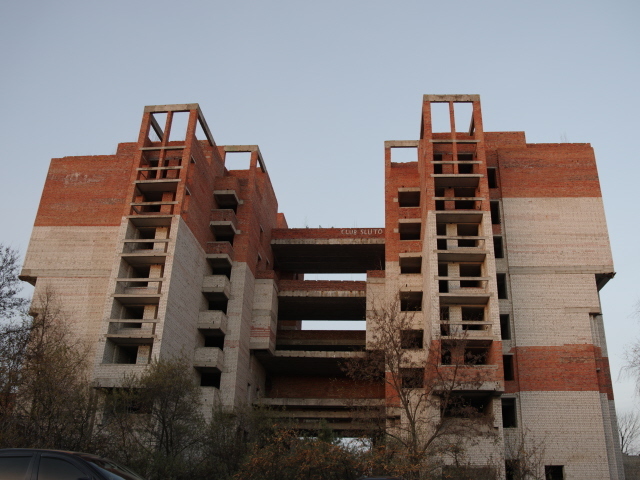 Like Pripyat, Slavutych was to be a privileged residential town, with much better housing quality and facilities than other similarly-sized towns in Ukraine or the rest of the USSR. Yet, despite those amenities and perks, not all residents found the loss of their previous homes in Pripyat easy to deal with. At ca. 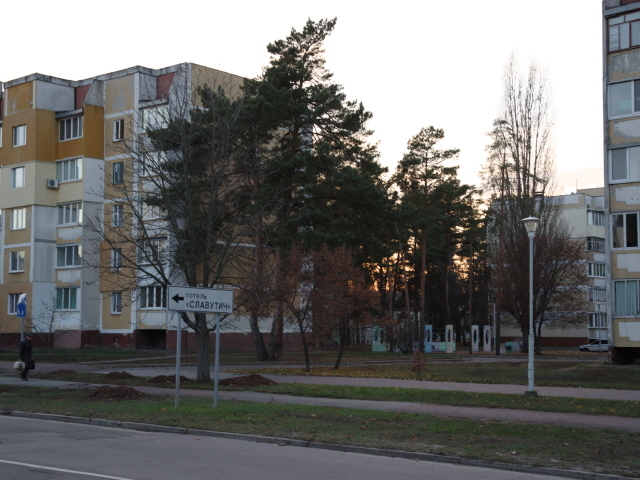 25,000 inhabitants these days, Slavutych is about half the size that Pripyat was in 1986. 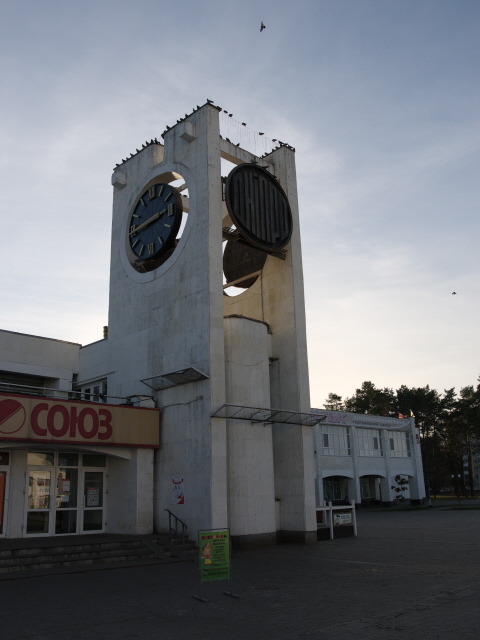 Now that the Chernobyl NPP is being decommissioned, many former employees who were running the NPP until the year 2000, when the last block was switched off, are now involved in other work, mostly related to the decommissioning of the plant – and so still commute daily to the site from Slavutych by train (see below). 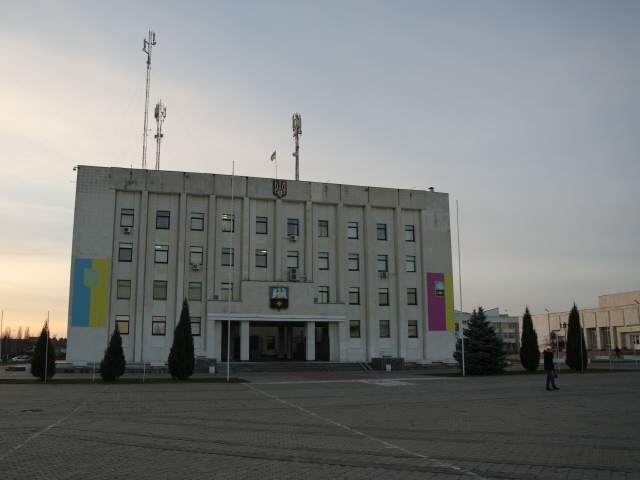 However, the longer-term future of Slavutych hangs somewhat in the balance. What will people do, what jobs could they find, once the decommissioning is completed? There have been some investment projects, but not all that much has come of this so far. The swampy land around the town is largely unsuitable for farming, and the place is far from any other industrial infrastructure, so it's unclear what economic niche Slavutych could possibly cut out for itself eventually. But these are not immediate worries, as the work at Chernobyl is likely to take several more decades yet. What there is to see: Not all that much. 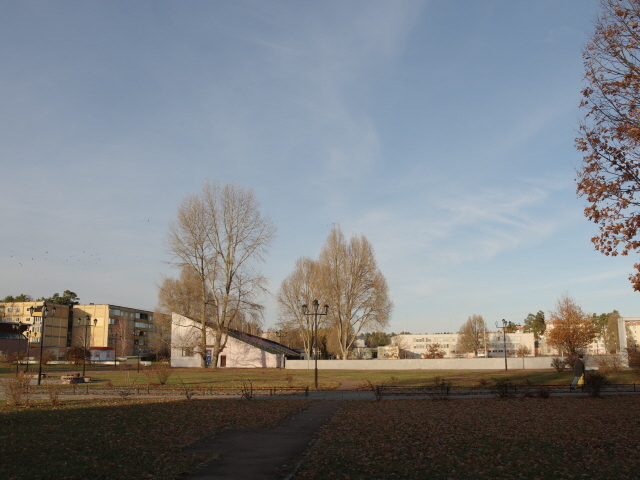 Normally such a remote and provincial new town would hardly feature on these pages, if it wasn't for the connection with Chernobyl, A) in terms of history, having come into being as a replacement for the evacuated town of Pripyat (see above). And B) there is the physical connection: the commuter train line that shuttles workers to the Chernobyl NPP and other construction sites in the Zone every morning and back every evening. And this offers a somewhat more exciting and “adventurous” alternative for entering the Zone as a visitor too. This is what I did when I went to Chernobyl for the third time in November 2018. My Chernobyl guide first drove us from Kiev to Slavutych, where we visited the local museum. 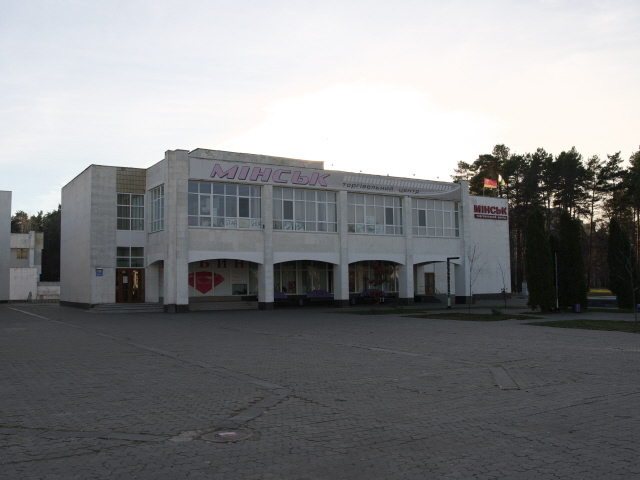 Then he left us there at a local hotel (see below) and then met us at the other end of the commuter train line the following morning at the Chernobyl NPP train station. The trains are free, so no ticket is required. You just board it together with all the workers, and off you go. Of course you are reliant on the guide actually being there at the other end, otherwise you'd be in trouble if you don't yet have the prerequisite permit for visiting the Zone. But this all went without a glitch when we went. As one of our little group of three was actually from Ukraine, there was even the possibility of chatting to a couple of the other people on board the train (one guy we met was a security guard at the NPP, which he was at first reluctant to disclose …). See under Chernobyl for more on this train ride. 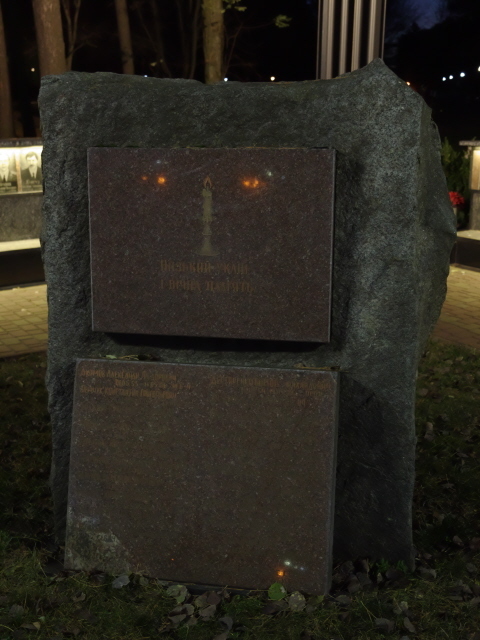 Other than that there is a monument to the first casualties of the disaster, including Valery Khodemchuk who was killed in the initial reactor explosion (see under Chernobyl NPP) as well as a number of the first responding firefighters and “liquidators”. 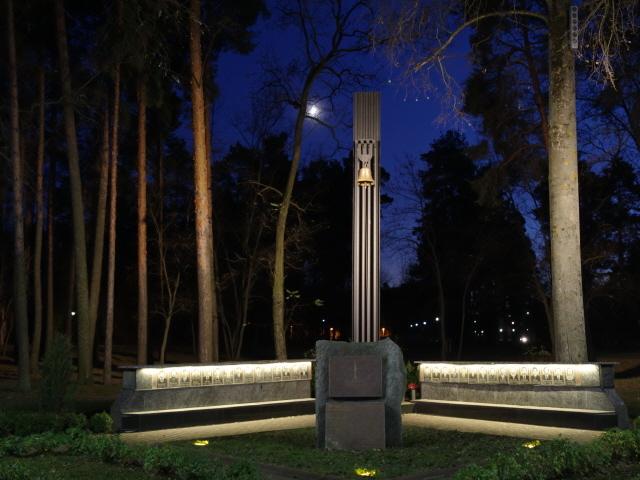 The monument features a single steel column with a memorial stone and some plaques at the bottom and behind it a row of portraits of the victims on polished stone (as is customary on Ukrainian and other Eastern European tombstones). 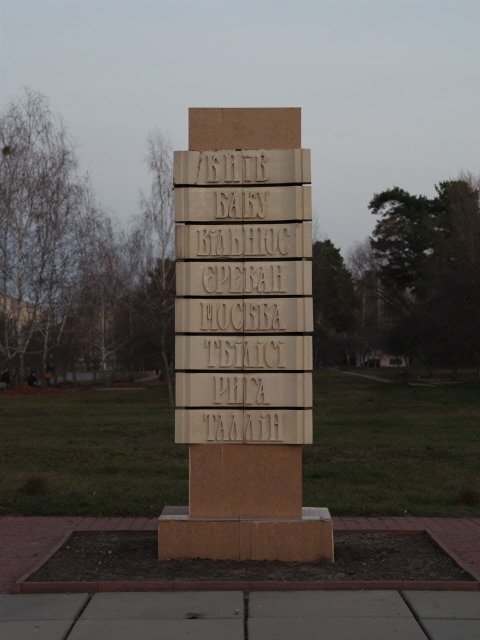 There's also a small monument honouring the eight Soviet republics that participated in the construction of Slavutych, naming their respective capital cities in sandstone: Kyiv, Baku, Vilnius, Yerevan, Moscow, Tbilisi, Riga, Tallinn. Another monument in the main square doesn't have any overt dark connections, but is topped with an angel figure that somewhat reminded me of the Angel of Uzupis in Vilnius. 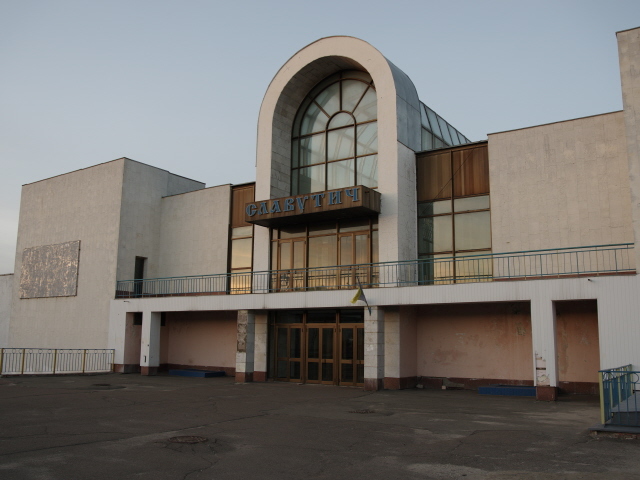 The rest of Slavutych isn't exactly a hip and happening hub of activity. During the day at least (when a large part of the population is in Chernobyl, of course) it was decidedly quiet here. However, we went for lunch in a rather spacious restaurant (named Old Tallinn) that had a huge stage and sound system, so maybe the evenings get wild here … who knows. 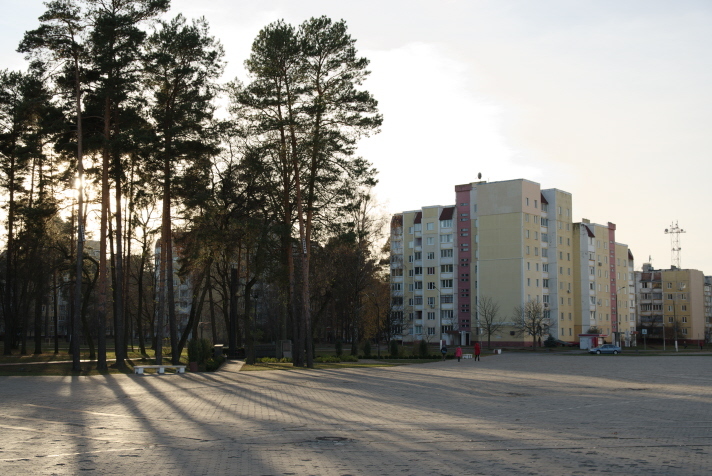 In contrast to Pripyat, Slavutych is less dominated by high-rise apartment blocks. The tallest I saw had nine storeys, while the majority of buildings are lower than that. Out of the central part, there are even areas of single-storey or two-storey detached family houses – something you didn't get in Pripyat at all. So all in all, you really only come here as a tourist if you want to enter the Chernobyl Exclusion Zone by train from here. The museum is a nice add-on, but otherwise this is pretty much the opposite of a touristy place. Location: in north-central Ukraine, not far from the border with Belarus, and 30 miles (50 km) east of Chernobyl. Access and costs: Easy only by car, as part of a longer Chernobyl tour, otherwise tricky; quite cheap itself though. 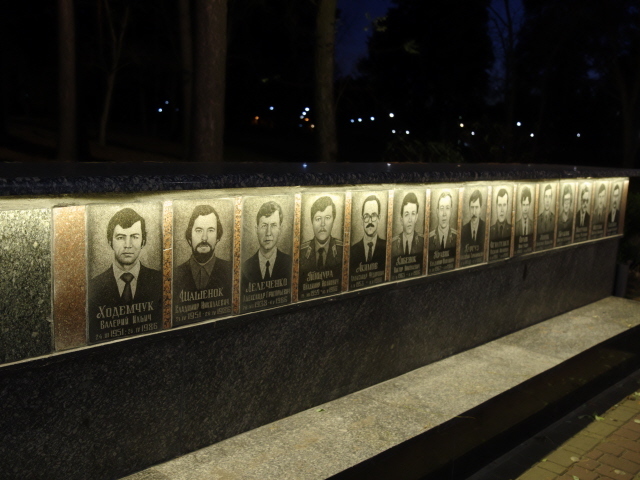 Details: The most likely scenario is that you will book the side trip to Slavutych as part of a longer tour of Chernobyl, which is what I did in November 2018. How much the side trip added to the total cost I cannot say exactly, but I guess it will be mostly for the extra transport from Kiev. The drive takes about two to three hours one way. The train to Chernobyl from Slavutych is free of charge. And the hotel in town is very cheap indeed (something like 20 EUR or less a night, breakfast and dinner included). Those those things don't contribute much to the extra costs. That hotel is, as far as I can tell, also the only option for accommodation for an overnight stopover here. It's a fairly recent construction, dating back to only 2012, and is modern with en-suite rooms that are more than adequate. 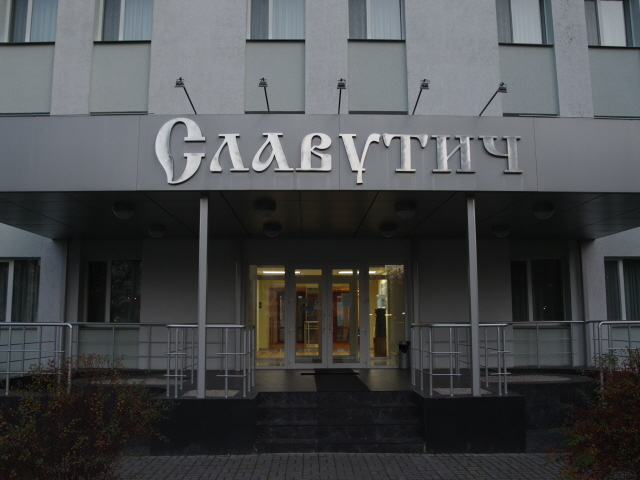 The receptionists even speak some English … probably because the hotel is also used (or rather: mostly used) by foreign contractors associated with the construction of the New Safe Confinement structure at the Chernobyl NPP or other such projects with foreign investment involved. There are a couple of supermarkets where you can get supplies, and for food and drink other than in the hotel, the place we were taken to for lunch is called Old Tallinn and it even has an English-language menu. And the mostly Ukrainian food was perfectly alright. Time required: Not much at all. A couple of hours for doing the museum and for a quick walk around town. But mainly you need an overnight stay here in order to get the early morning train to Chernobyl. 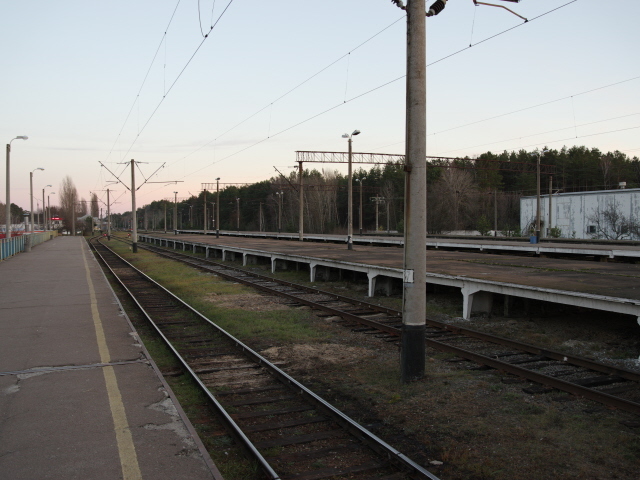 Combinations with other dark destinations: most obviously, and the primary reason for coming here in the first place: the train connection to Chernobyl! As you will most likely be driven here from Kiev, spending some time in that glorious city beforehand cannot be recommended highly enough. The contrast to Slavutych couldn't be greater. Combinations with non-dark destinations: Nothing really. 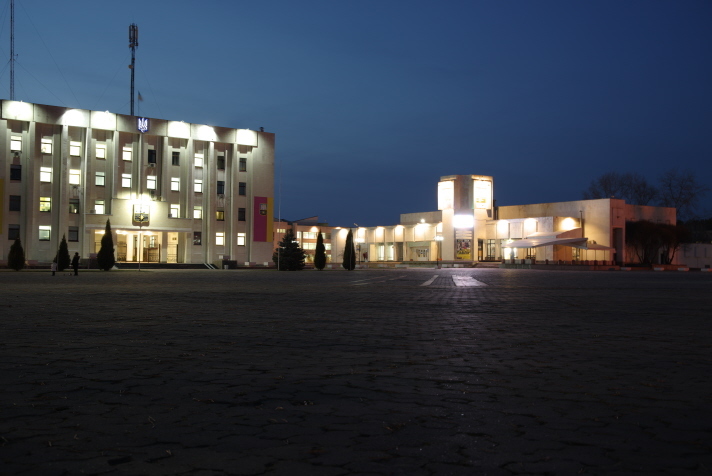 Slavutych may be not the worst town to live in, in terms of amenities, but for visitors there really isn't anything remotely touristy to see. For that better head back to Kiev.